SCAA is proud to announce the addition of RUGBY to SCAA! 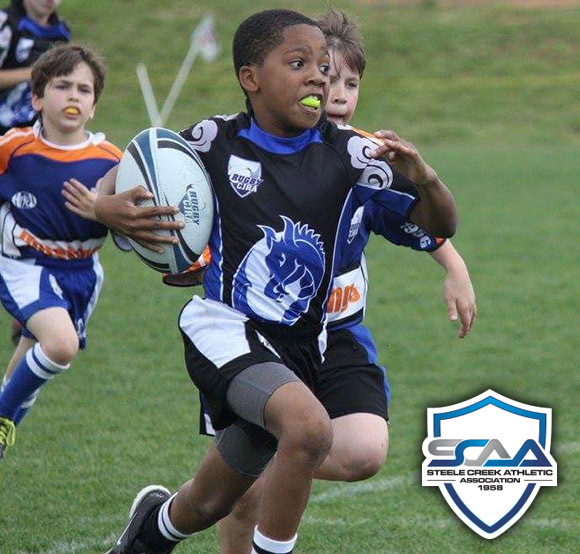 The Steele Creek DRAGONS will be joining The Charlotte Junior Rugby Association (CJRA) spring youth rugby league. Age division teams will play inter-league matches against teams in Charlotte and North Carolina and the option to play teams in VA and GA as well during special (optional) travel matches. CJRA also offers All Star and All American tracks for outstanding players – so the sky is the limit with how far our players can go! Game days are on Saturdays. The majority of games are played in the Charlotte area – including home games at SCAA. There are a few travel days on the schedule to eastern NC teams. NO EXPERIENCE IS NEEDED TO JOIN! CJRA uses expert, USA Rugby trained and certified coaches. They specialize in introducing players new to rugby to the game and making them competitive against other teams quickly. A CJRA team has won the NC State title for the last 4 years in a row and also won the Regional Championship last year. We are joining a winner! To register go to the following link – that is the CJRA Information/ Registration page. From there, click to create a login and password, then simply follow the registration process online to register – the whole process takes about two minutes. Please, remember to choose “Steele Creek Dragons” from the list of teams when you register. The cost for the entire Spring season is $225. This includes all coaching, matches, shorts, socks, team shirt, additional sports insurance and USA Rugby registration (required), and a car magnet for parents to proudly display. Additional costs can include cleats, extra mouth guards (the first one is included in the fee), and practice clothes (any active wear is fine). Generally, rugby is one of the less expensive youth sports to participate in. Add to that, Rugby is the FASTEST growing youth sport in the United States! Rugby will also be in the Olympics starting this Summer. Each year, college scholarships for rugby players double and that growth is expected to increase. If you are interested in giving rugby at SCAA a try we have a FREE CLINIC as part of a huge game day at SCAA in February. All families are welcome to come out and watch the games being played by more than a dozen area teams at all youth age levels. PLUS, there will be an area set up where rugby coaches will show SCAA kids some of the basics of the game and take them through a few drills to give them a feel for it. This day of rugby and the clinic are all offered for FREE. People will also be on hand to answer questions and to help with the registration process. If you are even slightly considering trying rugby – this is a DON’T MISS event. The games will be played from 10am until around 4pm – starting with the youngest divisions playing earlier on and going up in age as the day progresses.